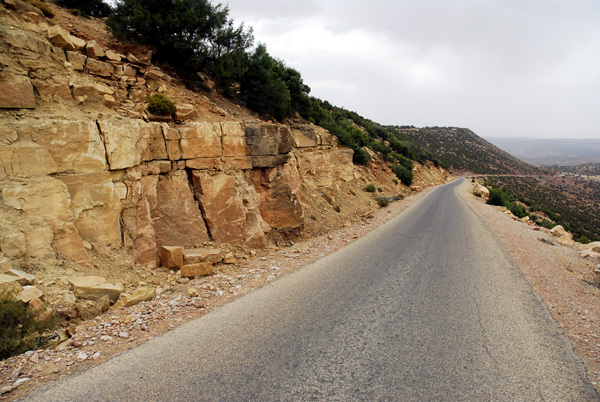 In the northern part, the major relief is Jebel el Hadid which has an altitude of about 659 m. It is composed of Jurassic limestone. 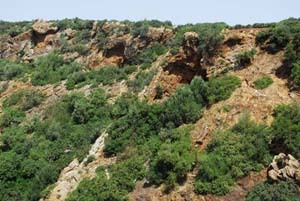 Hanno the Navigator (500 BC) exploited iron deposit in Jbel Hadid. 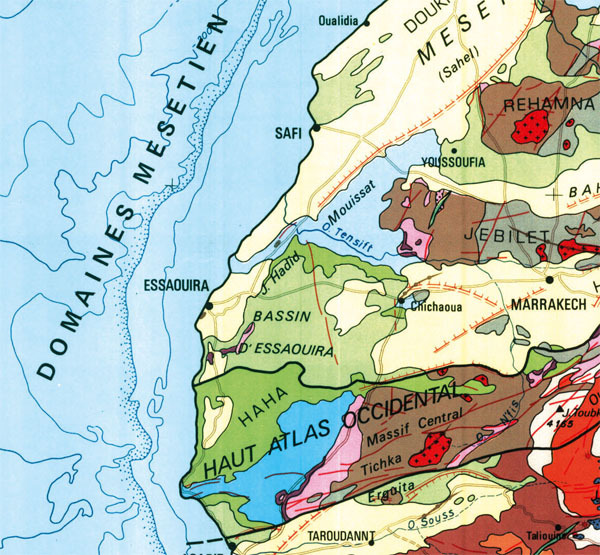 "The Oxfordian shale was sufficiently buried in western Essaouira to generate voluminous gas and condensate liquids, and to expel them into structurally closed Jurassic reservoirs (Toukimt field) or offset horst-block Triassic reservoirs (Meskala field). 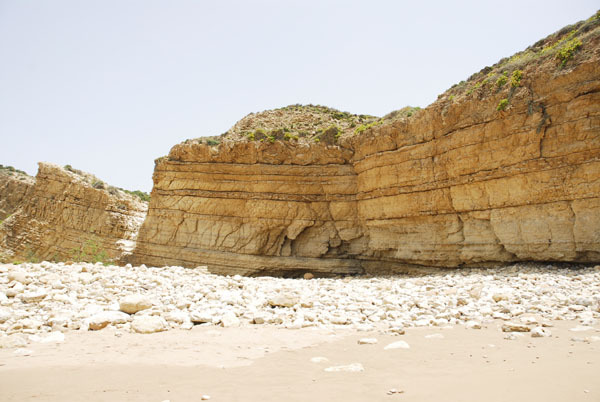 Geochemical evidence suggests that the Jurassic-age reservoirs across the eastern Essaouira basin host commingled gases sourced from Jurassic and Carboniferous strata. 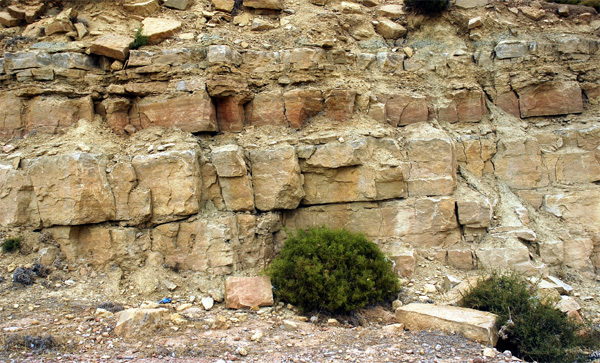 Coal methane, generated from a deeply buried Carboniferous interval, may have been the main source for the astern Essaouira basin. 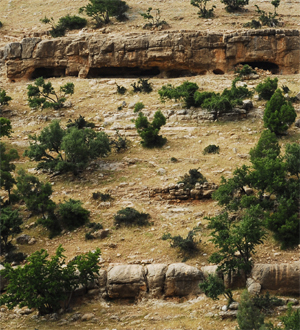 Traps developed as structures draping salt domes at junctions of offset transtensive faults." 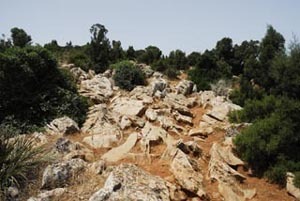 The water of this stream on the plateau of the mountain Djebel Hadid is salty. 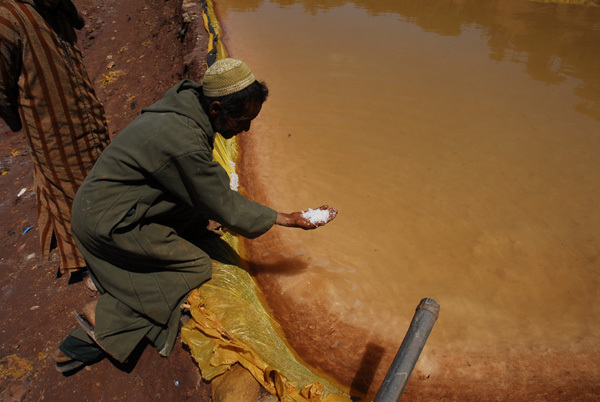 There are saline wells but there are also wells with fresh water just a few meters beside. 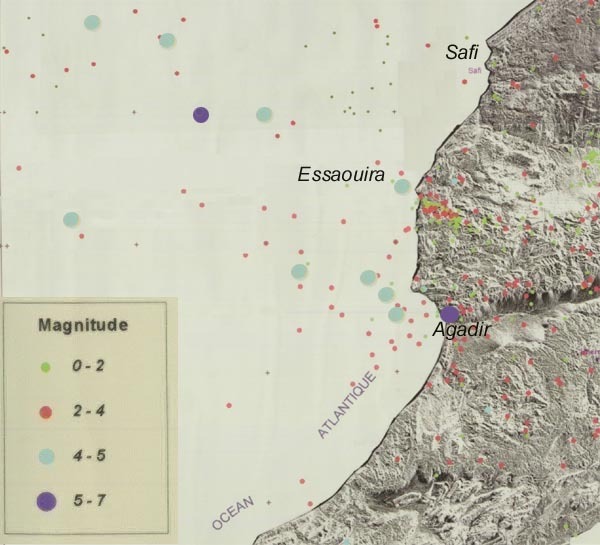 Old map of seismic activities in the Essaouira region. 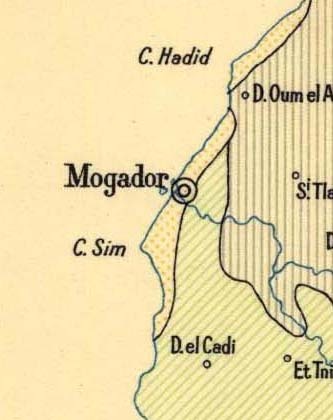 The most famous disaster for Mogador was the earthquake1st of November 1755, Lisbon ( Magnitude 9) and the following Tsunami with 15 m high wawes who destroyed parts of the towns at the Moroccan Atlantic coast including Mogador. 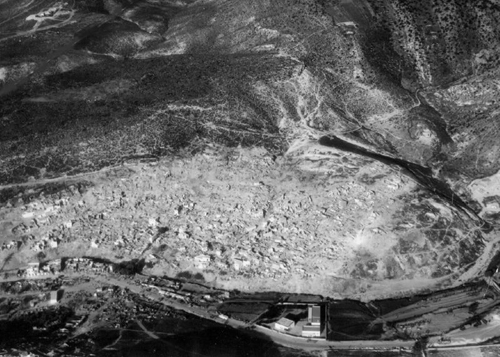 took place on February 29, 1960, at 23:40 local time. 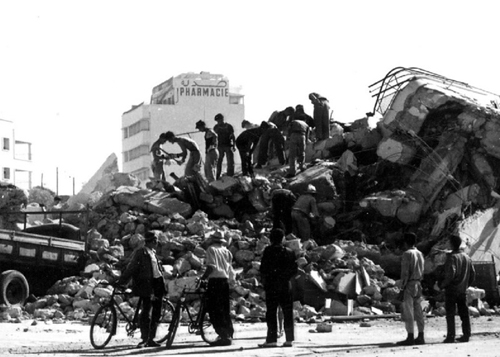 It was the most destructive and deadliest earthquake in Moroccan history with a magnitude of 5.7 Mw, killing around 15,000 people (about a third of the city's population of the time) and wounding another 12,000. At least 35,000 people were left homeless. 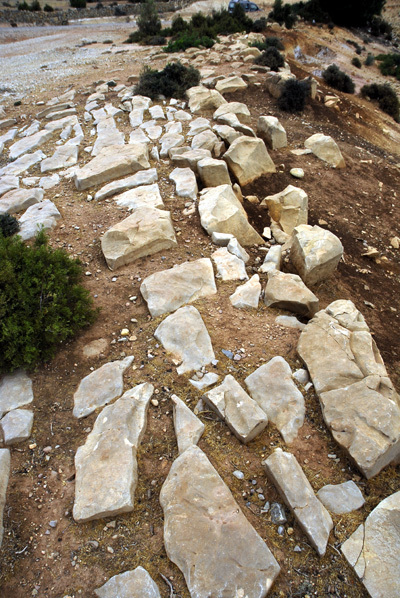 and proximity to the major city of Agadir made it very destructive. 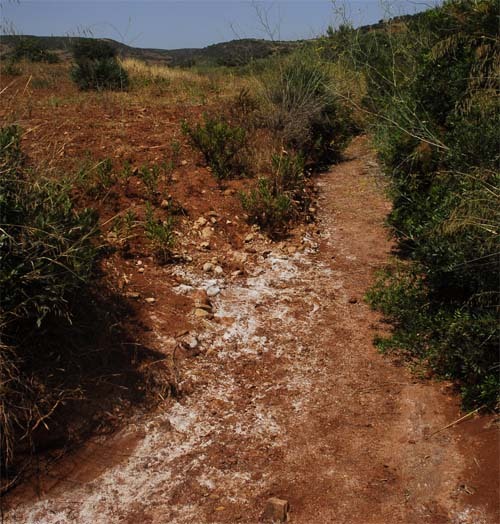 Salt from rainwaterponds where rocksalt is processed.